Here, six great recipes to make with a pile of shelled hard-boiled eggs. In anticipation of an egg-packed Easter Sunday, F&W Test Kitchen genius Justin Chapple revealed the fastest way to peel hard-boiled eggs with a spoon in this week’s edition of Mad Genius Tips. Here, six great recipes to make with a pile of shelled hard-boiled eggs. Beets and apple cider vinegar make a stellar brine for pickling hard-boiled eggs. They're an irresistible and nutritious snack. 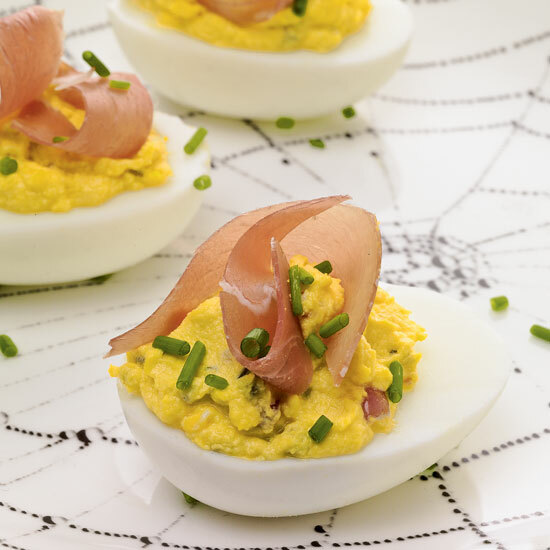 These deviled eggs get their terrific flavor from goat cheese, Dijon mustard and cornichons, plus a topping of country ham. This fun dish is a spreadable, deconstructed version of deviled eggs. Packed with roasted beets, hard-boiled eggs and tomatoes, this is the perfect comfort-food salad. Chef David Burke stuffs soft pita bread with deviled egg salad and thin slices of grilled beef for easy and incredibly satisfying sandwiches.